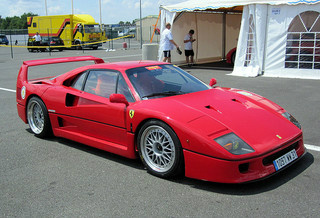 The F40 sports car. Launched in 1987 and priced at $400,000 ($830,000 in today's money), the two seater F40 Berlinetta was the most expensive Ferrari to date. 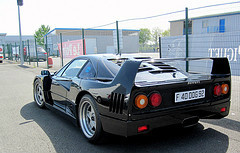 Initially, the company planned on producing 400 of the F40, but demand was such that the build programme was steadily increased until, by the time production ended in 1992, 1,315 units of this beautiful car had been built. 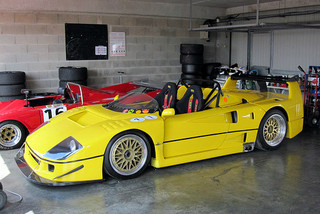 It was the final car to be approved by Enzo Ferrari himself before his death in 1987. Styled by Pininfarina, the lightweight body consisted of a composite mixture of carbon fiber, kevlar, and aluminium. To save more weight, the windscreen and windows were made of plastic. The interior was comparatively spartan, with no air conditioning, door handles, or even carpets, and the lack of insulation caused the cabin to resonate. Based on the 288 GTO sports car, the frontal area was kept to a minimum by a deep nose cone, and there was an under-tray to smooth the flow of air, with diffusers behind the engine. The final design displayed similarities with the 365 Berlinetta Boxer. With the additions of spoilers and a rear wing, it had a drag coefficient of 0.34. Using a tubular steel chassis, there was all round coil spring suspension with dampers and anti-roll bars, and four wheel disc brakes. Fuel consumption in the UK was 13 mpg in the city and 19 mpg on the highway. 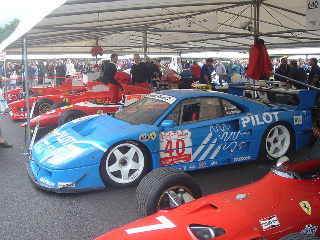 There was a limited edition of just 17 units of the LM (Le Mans) variant, which featured a strengthened chassis, larger front air dam, a larger adjustable rear wing, stiffer suspension, larger disc brakes and a racing gearbox. The highlight was a heavily modified 2.9 litre engine, which developed 760 bhp, with a top speed of 229 mph, and a 0-60 mph time of 3.1 secs. 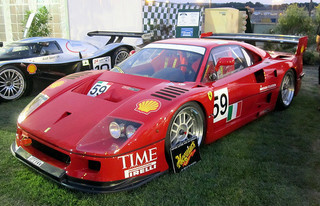 An original F40LM sports car sold at auction in the US for $2 million. It was powered by a 2.9 litre, V8 engine with parallel twin IHI turbochargers, which transmitted 471 bhp at 7000 rpm, with 16 psi of boost and slight turbo lag, to the rear wheels. It was the first time this type of set-up had been adopted by any car. A five speed manual gearbox was used with the highly distinctive H-gate pattern. It featured two overhead cams, two intercoolers, and an electronic engine management system in a car that weighed under 3000 pounds, some 500 pounds lighter than the Porsche 959. The engine cover was vented, which allowed its distinctive sound to be all the more audible. A catalytic converter was added in 1990 in response to US emission regulations. With a top speed of 201 mph, the production version produced a 0-62 mph time of 3.8 secs, whilst it came in at 3.0 secs with the track variant. It used dry sump lubrictaion and Weber electronic ignition, and its performance was more than a match for the 959, its main competitor. 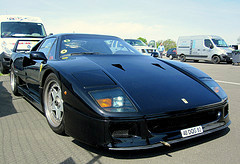 The F40 was the first road-going sports car to exceed 200 mph and, until 1989, was the world's fastest production car at 201 mph. Around the time of its launch, the main competition was the Lamborghini Countach, but in the early 1990's, the principal contenders were the Jaguar XJ220, and the Bugatti EB110, against both of which the F40 had its work cut out. In terms of the second hand market in the UK, a Ferrari F40 in good condition could command around £700,000, whilst a really fantastic example could reach as much as £1.2 million. In the Ferrari range, this was one of their true classic cars.